• For quantitative determination of alcohol dehydrogenase activity and evaluation of drug effects on its metabolism. • ALCOHOL DEHYDROGENASE (ADH) is an oxidoreductase which catalyzes the interconversion of alcohols and aldehydes or ketones. 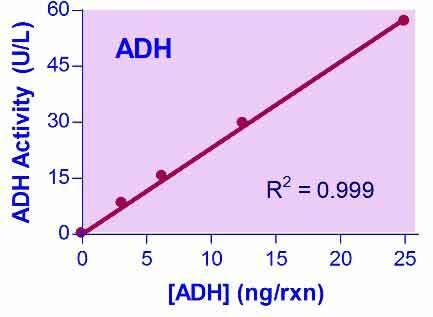 ADH is important in humans and other organisms for the break down of alcohols which may otherwise be toxic. In yeast and some bacteria, ADHs catalyze the opposite reaction and produce alcohol as part of fermentation. BioAssay Systems non-radioactive, colorimetric ADH assay is based on the reduction of the tetrazolium salt MTT in a NADH-coupled enzymatic reaction to a reduced form of MTT which exhibits an absorption maximum at 565 nm. The increase in absorbance at 565 nm is directly proportional to the enzyme activity.